The city is known for its rich Viking history and the prosperous whaling industry, which made Sandefjord the richest city in Norway. Today it has built up the third-largest merchant fleet in Norway. It is home to Europe's only museum dedicated to whaling, and is home to Gokstad Mound where the 9th century Gokstad Ship was discovered. Sandefjord has numerous nicknames, including the Viking- or Whaling "Capital" of Norway. The city is also known as the "whaling capital of the world." It has also been dubbed the "Bathing City" (Badebyen) due to its many beaches and former resort spas. It is still considered a resort town due to high numbers of visitors during summer months. Sandefjord has become a transportation hub, home of Torp International Airport, one of Norway's largest airports. Daily ferry connections to Sweden are provided by Fjord Line and Color Line from the city harbor. European Route E18, one of Norway's most important roads, traverses the municipality. Sandefjord is a stronghold for the Conservative Party; the Conservative coalition received over 70 percent of votes cast in 2011. Current mayor is Bjørn Ole Gleditsch from the Conservative Party, who has been mayor since 2004. The name originally belonged to the main fjord, now called the Sandefjordsfjord. The name Sandefjord, which dates to 1200 A.D., originates from the ancient farm name Sandar. The first element is the genitive case of the name of the parish and former municipality of Sandar. The name Sandar derives from the Old Norse term "sandar", which is the plural form of "sandr", translating to 'stretch of sand' (sandstrekning). The name Sandefjord was first mentioned in chapter 169 of Sverris saga from the year 1200. It was then referring to the fjord which is now known as Sandefjordsfjord. The coat-of-arms dates from modern times, having been granted on 9 May 1914. The Viking ship symbolizes the famous Gokstad ship, which was found in Sandefjord in 1880, one of the best preserved Viking ships known. The whale symbolizes that in the late 19th and early 20th century, Sandefjord was a main home port for whalers operating in the southern oceans. On 1 January 2017, Sandefjord received a new coat of arm after the merge with Andebu- and Stokke municipalities. The arms has the title: Courage and Strength, and is created in black and gold. The arms was designed by Erik Raastad from Sandefjord, with minor modification by the heraldic expert Jan Eide from Oslo. The decision to get a new coat of arms was made by the merger committee in Andebu on the 24 May 2016. The 9th century Gokstad Ship was discovered in Sandefjord. Sandefjord has been inhabited for thousands of years. Excavations indicate that people have inhabited Sandefjord for around 3,000 years. Rock carvings at Haugen farm by Istrehågan in Jåberg are dated to 1,500-500 BCE. Haugen farm is home to Vestfold County's largest petroglyph site. The Vikings lived in Sandefjord and surrounding areas about 1,000 years ago, and numerous Viking artifacts and monuments can be found in Sandefjord. One of the most important remains from the Viking age was found at the grave site Gokstadhaugen (Gokstad Mound) in Sandefjord. The Gokstad ship was excavated by Nicolay Nicolaysen and is now in the Viking Ship Museum in Oslo. The Viking, an exact replica of the Gokstad ship, crossed the Atlantic Ocean from Bergen to be exhibited at the World's Columbian Exposition in Chicago in 1893. A replica of Gokstad ship, called Gaia, currently has Sandefjord as home port. Other known replicas include the Munin, (a half scale replica) located in Vancouver, Canada. The Gokstad Ship, Norway's largest preserved Viking ship, was discovered during an excavation at Gokstad Mound in 1880. The Vikings first settled here due to its speedy route from Sandefjord and along the coast. Viking settlements and grave sites dating to the 1400s have been discovered in Sandefjord. Sandefjord functioned as a seaport defined by the twin industries of shipping and shipbuilding throughout the 1600s and 1700s. It was formally recognized as a market town by King Oscar in 1845. Its population at the time was 749 residents. Kurbadet is housed in one of the largest wooden buildings in the Nordics. The city became known as a world-renowned health resort destination between 1837-1939. Royalty and Prime Ministers from throughout Europe visited the town for its spas in the late 1800s. The city gained its reputation as a health- and pleasure community when Sandefjord sulfur spa and resort ("Sandefjord Kurbad") was established in 1837. It was the first spa in town and functioned as a medical institution focusing on the treatment of symptoms for rheumatic diseases. The original bathhouse has been restored and is now a culture house by the city center. It was one of Europe's most visited baths until its closure in 1939. Around 50,000 people, mostly Norwegians, visited the bath from 1837 to 1939. Majority of spa visitors were from Norway, but international guests from Germany, Britain and the United States also visited the spas of Sandefjord. Today the bath's building, Kurbadet, has been restored and hosts cultural events and various annual activities. Sandefjord has experienced numerous town fires, including a town fire in 1800 which led to most of the town burning down and subsequently having to be rebuilt. An additional fire in 1900 destroyed 56 houses and caused major damage. Whaler's Monument is made in style of a compass, and it rotates slowly. Sandefjord is perhaps best known as a whaling community. The centre of the world's modern whaling industry was located in town, and Sandefjordians not only made up practically all the crew on the Norwegian whaling fleet, but substantial numbers of Sandefjordians also worked within the whaling industry in nearby countries. For over fifty years in the late 1800s, Sandefjord functioned as the world center for the whaling industry, including the manufacture and equipment of whaling vessels, floating factories, and whale-catchers. The city has also been named the "whaling capital of the world." From 1850, a number of ships from Sandefjord were whaling and sealing in the Arctic Ocean and along the coast of Finnmark. The first whaling expedition from Sandefjord to the Antarctic Ocean was sent in 1905. Towards the end of the 1920s, Sandefjord had a fleet of 15 factory ships and more than 90 whalers. In 1954, more than 2,800 men from the district were hired as crew on the whalers, but from the mid-1950s whaling was gradually reduced. The number of southbound expeditions rapidly decreased during the 1960s, and the 1967/68 season became the last for Sandefjord. The shipping industry was gradually readjusted from whaling to other ship types during this period. The local Framnæs Mekaniske Værksted and Jotun Group Private Ltd. had major roles in this business. Today, the memories of this important period of the city's history are kept alive at the Whaling Museum (Hvalfangstmuseet). This museum is the only museum in Europe specializing in whales and the history of whaling. The history of the whalers can also be explored at the Museum's Wharf with a visit aboard the whale-catcher Southern Actor. Whaling is considered to be the industry which made Sandefjord the richest city in Norway. Sandefjord also has shipping traditions of tall sailing ships and steam ships. The full rigged sailing ship Christian Radich, three-masted barquentine Endurance, whale catcher Jason and Viking ship replica Viking were some of the many ships built by Framnæs Mekaniske Værksted. Hans Albert Grøn of Sandefjord established the first whaling station in the Faroe Islands in 1894, which was located at Gjánoyri on the island of Streymoy. Furthermore, Sandefjord was the headquarters of the South African Whaling Company (SAWC), which was established in 1908 and managed by shipowner Johan Bryde of Sandefjord. The Norwegian flag was raised at Framnæsodden in Sandefjord Cove on Antarctica's Peter I Island in 1929. Norway achieved sovereignty of Bouvet Island during Nils Larsen's Antarctic expeditions. Towards the beginning of World War I, Norwegian whaling spread throughout the world, most and foremost from Sandefjord. Expeditions from Sandefjord went as far as Norwegian Bay in Australia, Stewart Island in New Zealand, Walvis Bay in Namibia, Corral, Chile, and also isolated places such as Kerguelen Islands, South Georgia Island, Bouvet Island, and the Southern Ocean. In the 1910s, affluent Sandefjordian August F. Christensen was given a grant to practice whaling outside Peru and Ecuador. He was also appointed Ecuador's consul to Norway. He achieved an agreement with Ecuadorian government officials which allowed Norwegians to inhabit the Galápagos Islands, and also receive 200 hectares of land, pay no taxes for ten years, and be allowed to keep their Norwegian citizenship. Christensen created huge local interest of Galápagos, and the local company La Colonia de Floreana A/S was established on March 21, 1925. Its main goal was to exploit the Norwegian fishing rights at the Galápagos Islands. A ship named Floreana departed from Sandefjord on May 15, 1925, equipped with enough men and goods to establish a colony. Model of Whalers Church in Grytviken, exhibit at Sandefjord Museum. On November 16, 1904, Carl Anton Larsen of Sandefjord established the whaling community of Grytviken, the largest settlement in South Georgia and the South Sandwich Islands. South Georgia Island lies a few thousand kilometers east of Cape Horn. Nils Larsen (1900–76) was a sea captain from Sandefjord, famous for his expeditions of Antarctica in the early 20th century. It was under his expeditions that Norway achieved annexation of Bouvet Island in 1927 and Peter I Island two years after. A cove on Antarctica's Peter I Island is named Sandefjord Cove in honor of Larsen's hometown. Sandefjord Ice Bay in continental Antarctica is also named after Sandefjord. Mount Nils Larsen in Queen Maud Land, Mount Nils in Enderby Land and Nils Larsen Glacier are examples of many geographical names given in honor of Nils Larsen. German fortresses were constructed on both West- and East Island. At the beginning of the German occupation of Norway, a German Hafenkapitän (harbormaster) was placed at Tollboden, and a representative for Admiral Norwegen was placed in an office building at Framnes verft. German soldiers could be seen marching throughout the city. At the beginning of the occupation, over 2,000 German officers visited Socitetsbygningen (today's Park Hotel), which belonged to Sandefjord Spa. The Nazi flag was waving over the building during the visit. Norwegian students were told to learn the German language, and handed out a book, Deutsche Fibel. They were also given a copy of Adolf Hitler's book Mein Kampf translated into the Norwegian language. Albert Skålsvik of Krokemoa is honored at Minnehallen. German forces constructed two coastal forts in Sandefjord, located at the southern tips of both West- and East Islands. A 120-meter tunnel was constructed at Folehavna Fort on Vesterøya, as well as four 15 cm canons installed in concrete gun pits on the sloping rocks. German construction also took place by Goksjø Lake, and also at Jernbaneallén, where a former garage structure was turned into a prison camp. Many Sandefjordians were killed during World War II, including a number of seamen. Håkon Andersen of Framnes was killed onboard Arcturus when the ship was attacked by British Beaufighters. Albert K. J. Skålsvik (1921-1944) of Krokemoa, a member of the Norwegian Homefleet ("Hjemmeflåten"), was 18 years when the war broke out. Skålsvik was killed, along with the captain, when the ship DS Kong Bjørn was attacked by allied warplanes by Ryvingen Lighthouse in 1944. He is now commemorated at the Hall of Remembrance in Stavern (Larvik). Skålsvik's younger brother, Bernard, was also a part of the Homefleet and was killed at age 17 in 1945. Radios were illegal, and Sandefjordians such as Henry Melby of Gokstad was arrested for having a radio in 1942. He was incarcerated at the tanker Inger Johanne, which was attacked by allied warplanes in 1944, killing 15 people, including Henry Melby. Rural municipalities of Andebu and Stokke merged into Sandefjord in 2017. The municipalities of Sandefjord (S), Andebu (A) and Stokke (S) merged on January 1, 2017. The merge was the first of numerous nationwide merges following a municipal reform by the Solberg Cabinet. The "new" municipality is 425.47 km2, including freshwater lakes and rivers. It is 11th most populated municipality in Norway, and the most populous in Vestfold County. Proposed names for the "new" municipality were Gokstad, Sandar and Torp, however, the name Sandefjord was ultimately kept. A poll conducted by Sandefjords blad in January 2015 called 600 residents in Andebu, 750 in Stokke, and 1,000 in Sandefjord. All were given the question "Do you think Stokke, Andebu, and Sandefjord should establish one single municipality?". 69% of Sandefjord residents answered "yes", while 64% (Andebu) and 61% (Stokke) answered "yes" in Stokke and Andebu. Few Stokke residents read Sandefjords Blad, the main newspaper of Sandefjord, and relatively few residents commute to Sandefjord proper for work. However, Sandefjord's wealth and its international airport have been seen as key factors as to why Stokke residents decided to merge. 77.8 percent of Stokke residents ultimately voted to merge into Sandefjord during the September 2015 elections. The bridge to Natholmen, one of 116 islands in Sandefjord. Sandefjord is a coastal city on the western shore of the Oslo Fjord. It can be described as a suburb of Oslo, situated 110 km (68 mi.) southwest of the capital. It is the largest city in Vestfold County. Its 93-mile long coastline has various beaches and sheltered coves, and several forests are also within city limits. The two peninsulas called Østerøya ("East Island") and Vesterøya ("West Island") contribute to a total coastline of 146 kilometres (91 mi), and form the Sandefjordsfjord and Mefjord. The coastline offers a wide variety of sandy beaches, skerries, and islets (116 in total), along with bays and sloping rocks. Forested areas are often laced with paths and lighted for trails for summer hikes and winter skiing. 124-116 islands are within city limits. Small island bays give shelter for overnight campers, and many islets have relatively accessible beaches. Of Sandefjord's total area, 37.7 square kilometres (14.6 sq mi) (31%) is agricultural and 36.2 square kilometres (14.0 sq mi) (26%) is forest. 2 percent is made up of lakes and rivers. Neighbouring towns are Tønsberg and Larvik. There were two natural lakes in Sandefjord prior to the 2017 merge: Goksjø, which is the third-largest in Vestfold County, and the smaller Napperødtjern (2,000 square metres (22,000 sq ft)). Artificial ponds include Bugårdsdammen, Brydedammen, Virikdammen, Kroksjø, Veradammen, Svarttjern, and others. Local wildlife such as moose, deer, and avifauna can often be observed near freshwater lakes and rivers. Sandefjord has four fjords: Sandefjordsfjord, Lahellefjord, Mefjord, and Tønsbergfjord, which it shares with neighboring Tønsberg. The highest point in the municipality is Brånafjell at 398,9 moh. (1,308.7 ft.), which lies northwest of Høyjord. Hjertås at 148 meters above sea level is the highest point in the city of Sandefjord. From the peak are surrounding views of the Oslofjord, Vealøs by Skien, Skrim and Torp. Bytunet in City Center, spring 2008. The climate of all of Norway is extremely affected by the Gulf Stream. Were it not for the warming effects of the Gulf Stream, coastal cities by Oslo Fjord would be up to 4 °C (7 °F) colder. This means that the climate, the summers especially, are warmer than in other regions at the same latitude, i.e. the State of Alaska or Siberia. Sandefjord has a higher latitude than Juneau, Alaska; Sandefjord is at 59°08′N, while the capital of Alaska is at 58°18′N. Sandefjord experiences more sun than any other Norwegian city during the summer months. Warm breezes from Skagerrak cause a mild climate, and Sandefjord experiences the highest annual number of cloud-free days in Norway. The climate is relatively mild for its latitude. Fields become green in early May, but the air remains slightly cold. The summer seldom begins before the end of May, when temperatures often rapidly increase. The whole month of June and most of July experience little darkness during night and songbirds are silent for only 2–3 hours at most. July is the warmest month of the year in Sandefjord when temperatures often rise above 20 °C (68 °F). Sandefjord has a relatively humid semi-arid continental climate with warm summers, no dry season, and relatively much precipitation year long. During the colder season, which is from the end of November until early March, there is a 56 percent average chance that precipitation will be observed during a given day. The likelihood of snow falling is highest in late January and the season in which it is likely to snowfall spans from early November until early April. The coldest day of the year in Sandefjord is February 4, with an average low temperature of −6 °C (21 °F) and average high of only −1 °C (30 °F). Høyjord stave church is the only stave church left in Vestfold County. A small part of Sandefjord - the Himberg farm - is lying as an exclave inside the borders of the municipality of Larvik. All efforts at annexing Himberg into surrounding Larvik have been met with massive protests from local residents. A 1995 annexation attempt was ultimately canceled due to large protests from Himberg residents. Himberg is a rural agricultural community consisting of no more than ten households. There are only four similar exclaves in Norway, and Himberg is the most populous exclave in the nation, with a population of around 40. It is 1.4 km2 (0.54 sq. mi.). The elementary school Byskolen in city centre. 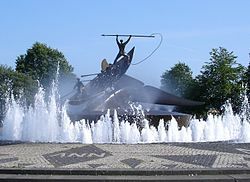 Whaler's Monument, a Sandefjord trademark, is located at the end of the city's main street, Jernbanealléen, in the harbour area. Nearby are the oceanfront restaurants Kokeriet and La Scala, two of the relatively few places where whale meat is regularly served. The Train- and nearby bus stations are approximately 800 m. (0.5 mi.) up Jernbanealléen from the waterfront. The main commercial areas are found on Jernbanealléen (main street), Storgata, Kongensgate and Hvaltorvet Shopping Centre. Sandefjord has a city centre, consisting of a mixture of old and modern buildings and a selection of shops. It has a good selection of restaurants and cafés. According to the renowned restaurant guide, Salt & Pepper, Sandefjord holds what is possibly Norway's best gourmet restaurant which is located in a modern building near the harbour, known as Brygga11, run by Bocuse d'Or winner Geir Skeie. Other restaurants include Chili, Kismat, Restaurant La Scala, Peppes Pizza, Kokeriet, Zorba, Lady og Landstryker'n, and others. Also located at the harbour, is the fishmonger well known for the quality of its goods and delicacies, including freshly caught shrimp, crab and fish. The fishmonger, known as Brødrene Berggren, was established in 1911 and is among the oldest in Norway. In the Bakgaarden (backyard) area are numerous cafés, boutiques, and art shops, as well as occasional summer concerts. Restaurants are found throughout the city and offer local specialties such as smoked salmon, dry-cured salmon, moose, reindeer, grouse, and deer. Sandar Haandverksbryggeri is a popular microbrewery, while wine-tastings are offered at SMAK Winebar. Bars include Draaben Bar, James Clark Pub, Brygga Bar, and Pir 4. Art Nouveau style in architecture is richly represented in Sandefjord. Sandefjord's architecture varies from smaller tree homes to large modern complexes. Sandefjord is one of few Art Nouveau towns in Norway; it is the town with the second-most Art Nouveau buildings in Norway. The major town fires of 1882, 1900 and 1915 devastated much of town and paved the way for new architecture. While neighboring towns mostly consist of wooden clapboard houses, Sandefjord is home to pastel-painted fronts, spires, turrets, and gargoyles. Jugend style structures include Saint John the Baptist's Church, Privatbanken, Gunilla's (Kongens gate 18), and an award-receiving 1915 structure at Stockfleths gate 9. Noble examples are also found at Chr. Hvidts Plass, including the bakery Ivar Halvorsen (built in 1900) and the former Methodist Church (1918). Certain parts were left untouched by the town fires, including the street known as Bjerggata. Bjerggata is the oldest or one of the oldest parts of Sandefjord. It consists mostly of white wooden homes and is an indicator of how Sandefjord looked until the 1950s. Most of the homes at Bjerggata are dated to the early 1800s. Other architecture includes the Viking-inspired dragon style complex from 1899, which housed Sandefjord Spa. It is one of Scandinavia's largest wooden buildings. Sandefjord is a stronghold for the Conservative Party. In the Norwegian local elections of 2011, 47.9% of voters voted for the Conservative Party. The right-wing parties received a total of 70.4% of the vote in Sandefjord, compared to 51.2% nationwide. The current mayor, Bjørn Ole Gleditsch, was elected in 2004 with the support of the Progress Party. Gleditsch is the wealthiest mayor to ever be elected in Norway. Cathrine Andersen from the Progress Party has been deputy mayor since 2015. With assets of nearly half a billion kroner, Bjørn Ole Gleditsch (H) is the richest mayor in Norway. The municipal council of Sandefjord is made up of 57 representatives that are elected to four year terms. Each representative from Sandefjord proper is represented by 1,160 inhabitants, representatives from Stokke by 1,045, and Andebu by only 837 residents per municipal council member. According to Statistics Norway in 2017, the municipality is home to 62,622 residents. There were 2,797 vacation homes in Sandefjord as of 2018, and 2,19 people per housing unit. 69.2% are members of Church of Norway, 18% are unaffiliated and 12.8% are members of other religious communities. In addition to State Churches, the city also houses various minor congregations, including an Adventist- and Methodist Church. Religious minorities with congregations in town include Pentecostals (Salem), Catholics (St. Johannes Døperen), Methodists (Metodistkirken), Seventh-day Adventists (Adventkirken), Baptists (Baptistkirken), Norwegian Lutheran Mission (Den lille gren), Jehovas Witnesses (Rikets Sal) and Muslims (Alkawther Islam Center and Sandefjord Islamic Center). Brunstad Christian Church (Smith's Friends) is an evangelical non-denominational church which was established in neighboring Horten in 1905. Brunstad Conference Center is the denomination's headquarters and is located in Stokke. It is the only worldwide denomination which was established in Norway. The largest minority groups in 2017 (first- and second generation immigrants) are Lithuanians (1.95%), Polish (1.93%), Iraqis (1.24%), Vietnamese (0.80%), Germans (0.71%), Swedes (0.69%), Kosovans (0.67%), Bosnians (0.64%), and Danes (0.51%). Sandefjord has a high population density of 339 people per square kilometre. The population density is particularly high in Sandefjord proper, and between E18 and the coast, the city has an equivalent population density to that of the Netherlands. The population increases significantly during summer months due to tourism. After the merge with Stokke and Andebu in 2017, Sandefjord has a population of over 63,000. This makes Sandefjord to the 11th most populous municipality in Norway. It is the most populous city in Vestfold County; One in four people from Vestfold County are from Sandefjord, or 25.2 percent of the county population. Jotun is one of the world's largest manufacturers of paints and coating products. Sandefjord is the wealthiest city in Norway. Important industries in Sandefjord are information technology, chemical production, tourism, navigation, ship building and fishing. It is home to the international airport Torp Airport, paint producer Jotun, the brewery Grans Bryggeri, the chocolate factory Hval Sjokoladefabrikk, and the engineering company Ramboll Oil & Gas. High-tech and information technology have become important industries in recent times, represented by some of Norway's largest web shops: Komplett, mpx.no, and netshop.no. The largest employer, besides the city itself, is Jotun, which was established in Sandefjord in 1926. Jotun is now one of the world's largest manufacturers of paints and coating products. As of February 2017, Jotun has a presence in over 100 countries and employed 9,500 employees worldwide. The Jotun Group operates four divisions, while its head office is located in Sandefjord. While Jotun by far is the largest company in Vestfold County, the second-biggest company is Komplett. A web shop operating in all of Scandinavia, Komplett had a 7.3 billion NOK revenue in 2015 and had 800 employees. Sandefjord had Norway's most expensive seaside vacation homes as of 2011, with an average price of 7.2 million crowns. General property values in Sandefjord appreciated 25.7 percent between 2010-2015. Sandefjord Whaling Museum has had over one million visitors as of 1994. The bilingual interpretive sign at Gokstad Mound measures 23.5 meters, symbolizing the Gokstad Ship's length. Sandefjord is dubbed a resort town due to its many summer visitors. Sandefjord is also nicknamed the "Bathing City" due to its many beaches, islands and minor archipelagos. Beaches such as Vøra and nearby Langeby on West Island attract summer visitors from Oslo and other larger Norwegian cities. Sandefjord became a bathing destination when sulphur was discovered in waters and gyttja in 1837. Sandefjord is home to over two thousand vacation homes, most of which are built along the seaside. Sandefjord had Norway's most expensive vacation homes as of 2012; the mean vacation home price was 7.1 million crowns in 2012. Vøra attracts tourists from all of Norway, and can be crowded during summer. The city of Sandefjord may be best known for its bathing and many beaches. It is first and foremost known as a summer community. The city lies on a low, slightly inclined strand, protected on three sides by hills, and only open towards the south where the Sandefjordsfjord is located. It is known for its great bathing and pure sea water quality. It has a country-like appearance with clean streets and quaint roads. The city is dependent on the bathing establishment during the summer season when many tourists arrive in Sandefjord. The bathing season in Sandefjord generally begins on June 1, while it ends on the last day of August. Visitors to Sandefjord Spa in the 19th century were the city's first tourists, and made Sandefjord into a popular holiday destination. The city's fame as a seaside mecca dates back to 1837, when sulphur springs first where discovered in town. Sandefjord has been nicknamed "Eastern Norway's vacation paradise." A majority of current tourists and vacation homeowners are from the capital of Oslo. Sandefjord is home to four hotels: Scandic Park Hotel, Hotel Kong Carl, Sandefjord Motor Hotel, and Clarion Collection Hotel Atlantic. The 9th century Gokstad Ship was discovered in Sandefjord during an 1880 excavation led by Nicolay Nicolaysen. The ship itself, which is now at the Viking Ship Museum in Oslo, was built around year 910. It is the largest preserved Viking ship in Norway. A Viking chieftain was buried at the Gokstad Mound (Gokstadhaugen), along with the 23.5-meter Gokstad Ship. Interpretive signs have been put up at the Gokstad Mound on Helgerødveien. Sandefjord has four churches remaining from the Middle Ages: Høyjord stave church, Kodal Church, Skjee Church, and Andebu Church. While Andebu Church has Norway's oldest parish register (dated 1623), Høyjord stave church is the only stave church left in Vestfold County. Its chancel dates to year 1100 and is the oldest part of the church. Burial mounds dating to the Viking Age can be seen around the church. Sandar Church by Sandefjord Station was constructed atop of the ruins of a Medieval church dated to the 13th century. The present church, however, was erected in 1792. Harbour Chapel is the only floating church in Europe, and possibly in the world. Midtåsen Sculpture Park contains a collection of bronze- and marbleworks by sculptor Knut Steen, which is housed in a pine forest pavilion overlooking Sandefjord and its fjord. The former estate of shipping magnate Anders Jahre is located at Midtåsen, and is now owned by the municipality. Guided tours of the villa are available. Hjertnes Civic and Theater Center is home to three auditoriums and an outdoor amphitheater. A movie theater, City Hall and library are found at Hjertnes. Concerts, opera, and other cultural events also take place at Hjertnes Civic Center. Sandefjord is home to Europe's only museum dedicated to whaling, which is located in the city center. The museum was one of the first original museums in Norway when established in 1917. Today it boasts over 150,000 photographs as well as exhibits of marine animals, a restored whale catcher, and more. A whale catcher named Southern Actor is docked at Museum's Wharf and is a part of the Maritime Museum. It is the only whale catcher from the Modern Whaling Epoch still to be in its original working order. It was constructed by Sevilla Whaling Co. in 1950 and brought to Sandefjord in 1989. There are six protected buildings in Sandefjord as of 2008: City Museum (Bymuseet), Maritime Museum (Sjøfartsmuséet), and the three farms Elverhøy-, Nordby-, and Auve farms. The city's oldest house, which is located at Skippergaten 6 and was built in 1667, is also one of the city's protected structures. The City Museum and Maritime Museum, along with Sandefjord Museum, are the three museums found in Sandefjord. Sandefjord Museum is among the world's largest whaling museums. Daily ferries connect Sandefjord to Sweden. Sandefjord Airport Torp is one of Norway's largest airports, and is particularly known for its high number of international flights. Torp is Norway's second-largest airport in terms of international flights in 2003. As of 2003, Torp had over one million annual passengers, of which around 50% were for international flights. Despite being located 74 miles south of Oslo, Torp is sometimes called Oslo Airport Torp. It is reached with a free shuttle bus from Sandefjord Airport Station on Vestfoldbanen. Sandefjord Airport is a budget airline hub for airlines such as Widerøe, Ryanair, and Wizz Air. Torp offers direct routes to over 30 international- and domestic destinations destinations, including daily flights to European cities such as London and Amsterdam. The city is served by frequent intercity trains to Oslo and onwards to Oslo Airport. Color Line ferries Bohus and Color Viking connect the town to Strömstad in Sweden. Fjord Line is another ferry service connecting Sandefjord and Sweden. Neighboring town of Larvik is home to daily ferry operations between Norway and Hirtshals, Denmark. Scandi Line was a former ferry service operating ferries between Sandefjord and Sweden. Sandefjord is also home to a domestic ferry route: MF Jutøya transports people and goods to Veierland Island from Engø peninsula several times per day. Sandefjord is also a cruise ship destination. European route E18 traverses the municipality. It is one of Norway's most important main roads, and makes the drive to Oslo approximately 90 minutes. Only Bergen- and Oslo Airports have more international flights than Torp Airport. Sandefjord Station is the central train station and is served by NSB InterCity Express trains operated by Norwegian State Railways. The main bus station is also located by Sandefjord Station. Fast and frequent express buses from Sandefjord shuttle along E18, connecting to Kristiansand and linking key resorts in Southern Norway. Trains and buses for Sandefjord leave Oslo Central Station (Oslo S) every 30 minutes, and the journey takes two hours. The public transportation system in Sandefjord is known as Vestfold Kollektivtrafikk (VKT). Besides Sandefjord Station, additional railway stations include Sandefjord Airport Station and Stokke Station. Torp Express Bus Service operates buses from Sandefjord Airport to Oslo. There are free shuttle buses between Sandefjord Airport Station and Sandefjord Airport. Sandefjord Airport Torp is one of Norway's largest airports. Bugårds Park is home to the city's largest sporting grounds and facilities, including areas for soccer, tennis, handball, badminton, archery, rollerskating, horseback-riding, water sports, ice hockey, and ice skating. The park sits by Sandefjord High School and is also home to a walking path, duck pond and designated picnic areas. The swimming center with its 2,500 m2 public pool is also located in Bugårds Park. Indoor handball courts are housed in Jotunhallen, while tennis courts are found in Pingvinhallen. Sandefjord Golfbane is an 18-hole golf course located at Jåberg, 5 km (3.1 mi.) from the city center. It was designed by Peter Chamberlin. Sandefjord Fotball is a professional football club which plays in Tippeligaen/Eliteserien (Norwegian Premier League). The team previously played home games at Storstadion, but has played at Komplett Arena since its opening in 2007. The club reached the Norwegian First Division in 1999, the year after its foundation. Sandefjord is noted for its strong performance in professional handball. From 1991-2008 Sandefjord TIF won nine Men's Premier League and another local team, Runar Håndball, won four. Sandefjord TIF Handball won the Men's Premier League again in 2005-06. Sandefjord High School is the largest in Norway. Sandefjord High School (SVGS) has about 2,000 students and is Norway's largest high school. It is a result of the merge between Sandefjord's four former high schools. Skagerak International School is also located in town and offers English-speaking kindergarten, elementary school, middle school, and high school. Other private schools include Moe- and Mokollen schools. Skiringssal folkehøyskole is a folk high school in Sandefjord, which is owned by Vestfold County. There are six public middle schools in Sandefjord: Andebu-, Breidablikk-, Bugården-, Ranvik-, Stokke- and Varden middle schools. There are 21 public elementary schools in town. Sandefjord High School (SVGS) and its two-story 32,000 m2 (344,000 sq. ft.) facilities are located at Krokemoa near the Bugårds Park. It is a public International Baccalaureate World School, but also offers general academics (the college preparatory studiespesialisering of the Norwegian school system), as well as elite sports, vocational education, and more. Skagerak International School is a private, English-language, International Baccalaureate World School at Framnes. Its education is offered to both international- and Norwegian students. Established as a High School in 1991, the school expanded to include a kindergarten as well as Primary- and Middle schools in 2000. The basis of the education is formed by the International Baccalaureate Primary Years (PYP), Middle Years (MYP) and Diploma (DP) programs. Skagerak is located in a renovated shipyard on the waterfront at Framnes. Camps and excursions are offered for all Primary- and Middle School students, as well as two or more annual trips abroad. High School students travel abroad for cultural and service-oriented trips, mostly to areas in Europe, Central Asia, and Africa. The High School is a member of UNESCO's SOUL project. Sandar Church was consecrated in 1792. Rock settings at Istrehågan resemble a ship. Nearby Haugen farm is home to Vestfold's largest petroglyph site. Gokstad Burial Mound, site of the discovery of the 9th-century Gokstad Ship. Sandefjord Museum (the Whaling Museum), Europe's only museum dedicated to the whaling industry. Southern Actor, whale-catcher turned museum ship. Only whale catcher from the Modern Whaling Epoch still to be in its original working order. Sandefjord Spa (Kurbadet), the 1899 thermal baths are housed in one of Scandinavia's largest wooden buildings. Bjerggata, one of the oldest parts of town with preserved wooden houses. City Park (Byparken), built after the town fire of 1900. Home of the statue Mother and Child by Arne Durban. Hjertnes Civic and Theater Center, adjacent to Badeparken and Scandic Park Hotel. Sandar Church, built on ruins of a 13th-century medieval stone church. Present church was erected in 1792. Gaia Ship, replica of the Gokstad Ship at Museum's Wharf in Sandefjord Harbor. Midtåsen Sculpture Park, park dedicated to artist Knut Steen. Home to the former villa of Anders Jahre. Sandefjord Church, 1903 church, home of Sandefjord Church Bells and host of various concerts and events. Høyjord stave church, in Andebu, only preserved stave church in Vestfold County. Hvaltorvet Shopping Centre, largest shopping mall in Sandefjord, located in the city center. Bugårds Park, home of Storstadion, 20-acre duck pond, public pool, ice-skating rink. Harbour Chapel ("Bryggekapellet"), only floating church in Europe and possibly in the world. Folehavna Fort, ruins from a German fortress constructed in 1941 during the German occupation of Norway. Istrehågan, ancient burial ground which dates to the Roman Iron Age around 1500-500 BCE. Dakota Norway, Norway's only Douglas DC-3 aircraft is based at Torp. View from Tønsberg Barrel, a seamark known since the days of King Sverre. Sandefjord has some of Eastern Norway's largest preserved coastal recreation areas. There are 20 km (12.4 mi) of coastal hiking trails on Østerøya peninsula, including to its southern tip where Tønsberg Barrel is located. Tønsberg Barrel is an old beacon mentioned in Sverris saga. The 20 km coastal path at Østerøya (East Island) is an extension of the 25 km (15.5 mi) coastal path on Vesterøya (West Island). These 45 kilometers (28 mi.) of hiking trails are part of the international North Sea Trail. Additional hiking trails are found at Preståsen, Hjertnes Forest, Fjellvikåsen, Mokollen, Midtås, as well as the Culture Walk. 100 km of hiking trails are attached to trailheads by Heisetra in rural Andebu. Sandefjord is home to ten cross-country skiing trails (loipes). Goksjø is a 3.47 km2 (2.15 mi2) lake on the border between Sandefjord, Larvik, and Andebu. It is the third-largest lake in Vestfold County. Goksjø is popular for swimming, kayaking and fishing; some of the fish species found here are Northern pike, European perch, Ide, Common dace, European eel, Salmon and Brown trout. Freshwater fishing is also common by rivers such as Svartåa in Andebu and the Hagenes River in Kodal. Numedalslågen, which is considered one of Norway's best salmon fishing rivers, is located in neighboring town of Larvik. Sandefjord is home to numerous campgrounds, all which are located along the seaside. Campgrounds include Asnes, Granholmen islet, Langeby, Vøra, and others. Langeby is considered Sandefjord's best beach by Frommer's and Fodor's Travel Guides, and is home to Langeby Camping which offers boat- and kayak rentals. Tent camping is permitted on numerous nearby islands, including the 11-acre (4.5 ha) Hellesøya and 12-acre (5 ha) Buerøya. Langeby lies adjacent to Vøra, a neighboring beach and campground. Vøra tends to get crowded during warm summer days due to tourism. It attracts summer vacationers from throughout Norway during warm summer months. Tent camping is permitted in forests, minimum 150 meters (492 ft.) from nearest settlement. Langeby Beach attracts thousands of visitors every summer. Asnes (West Island): Campground, convenience store, public restrooms, diving boards, sloping rocks. Flautangen (East Island): Firepits, fishing, public restrooms. Folehavna (West Island): Hiking trails, fishing, sloping rocks. Ruins from a German fortress built in 1941. Fruvika (West Island): Firepits, benches, public restrooms. Granholmen (islet): Campground, convenience store, public restrooms, pier, boat rentals, playground. Grubesand (West Island): 100-meter beach with hiking trails, firepits, sloping rocks, picnic tables, fishing, and public restrooms. Langeby (West Island): Campground, convenience store, fishing, boat pier, restrooms, sloping rocks, floating platform, diving boards, showers, volleyball court, soccer field, playground. Sandtangen (Goksjø Lake): Freshwater beach with pier and floating platform. Skjellvika (East Island): Oceanside pier, diving boards, hiking trails, floating platform, sloping rocks. Tangen (West Island): Diving boards, floating platform, soccer field, playground, volleyball court, benches, toilets. Truber and Yxnøy (East Island): Sloping rocks, public restrooms, hiking trails, picnic tables. Vøra (West Island): Campground, convenience store, volleyball court, public restroom, playground, soccer field, floating platform. Goksjø Lake is used for ice-skating, swimming, kayaking, and fishing. Between 116-124 islands and minor islets are within city limits. Additional beaches include Bogen (Nallberg), Brunstad, Kleivern, Korsvik, Kulerødvannet, Sandbånn and Rossnesodden (Melsomvik), Storevar, Stålerødvannet, Ertsvika, Strandvika, Albertstranda, Ormestadvika, Trollsvann, and Vårnes. Numerous islets with beaches are only accessible by boat, e.g. Gåsøkalven, Ravnø, Buerøya and Hellesøya. Goksjø, the third-largest lake in Vestfold County, is home to beaches such as Gubbetangen and Sandtangen. Pirates of the Caribbean: Dead Men Tell No Tales (2017) was directed by two Sandefjordians. Both directors of Pirates of the Caribbean: Dead Men Tell No Tales (2017), Joachim Rønning and Espen Sandberg, are from Sandefjord. Hodet over vannet (1993) was filmed in Sandefjord. The 1996-remake is starring Cameron Diaz. Deadline Torp (2005), Norwegian film based on the 1994 Torp hostage crisis. It was directed by Nils Gaup and written by Jo Nesbø. An episode, "Power Junkies" (season 1), of Outrageous Acts of Science (2012) was partly shot in Sandefjord. Episode #5.26 of the British TV series Coach Trip (2010) was shot in Sandefjord. Den starkaste (1929), Swedish silent film partly shot in Sandefjord. Valfångare (1939), Swedish movie filmed in Sandefjord. It was directed by Anders Henrikson and Tancred Ibsen. Music video for "The Cabin" (2013) by Ylvis was shot in Andebu, Sandefjord. Music video for "Hvalfangsmuseet" (2011) by Bare Egil Band was shot in Sandefjord. Terje Vigen, 2012 German short film shot in Sandefjord. Eurasian lynx is rare but occasionally observed in Sandefjord. Wildlife includes the Mountain hare, European badger, European beaver, Roe deer, Red deer, Moose, Red fox, European hedgehog, European pine marten, and Norway lemming. More rare but occasionally encountered are the Gray wolf, Eurasian lynx, Wolverine and Brown bear. Wolves are extremely rare in Sandefjord, although they have been observed on numerous occasions. A wolf shot in neighboring Lardal in 2013 was the first wolf killed in Vestfold County in over 100 years. Common European Viper is the only venomous snake found in Norway. There are an additional two non-venomous snake species found in Vestfold County: European Grass Snake and European Smooth Snake. The Slowworm is considered a lizard. Sandefjord High School is Norway's largest. ^ a b c Larsen, Erlend (2016). Tre kommuner blir til én. Erlend Larsen Forlag. Pages 13 and 171. ISBN 9788293057277. ^ a b c Porter, Darwin and Danforth Prince (2003). Frommer's Norway. Wiley. Page 158. ISBN 9780764524677. ^ "Things to Do in Sandefjord - Frommer's". Frommers.com. Retrieved 28 December 2017. ^ "Three shot in Sandefjord". Newsinenglish.no. Retrieved 28 December 2017. ^ "The Viking trail through Vestfold, Norway" (PDF). Destinationviking.no. Retrieved 28 December 2017. ^ Engel, Lyle Kenyon (1963). Scandinavia: A Simon & Schuster Travel Guide. Cornerstone Library. Page 145. ^ Ryder, Simon and Cameron Duffy (2018). Insight Guides Norway. Insight Guides. Page 163. ISBN 978-1786717580. ^ Alspaugh, Emmanuelle (2006). Fodor's Norway. Fodor's Travel Publications. Page 73. ISBN 9781400016143. ^ Bertelsen, Hans Kristian (1985). Sandefjord: A modern city with vast potential. Grafisk Studio. Page 81. ISBN 82-90636-00-8. ^ a b Alspaugh, Emmanuelle (2006). Fodor's Norway. Fodor's Travel Publications. Pages F-7 and 73. ISBN 9781400016143. ^ a b Berman, Martha (1995). Fielding's Scandinavia. Fielding Worldwide. Page 240. ISBN 9781569520499. ^ "Høyre vant valget i Sandefjord". Nrk.no. Retrieved 28 December 2017. ^ "Mørkeblått flertall i 61 kommuner". Kommunal-rapport.no. Retrieved 28 December 2017. ^ "Karakterer". Klassekampen.no. Retrieved 28 December 2017. ^ Bertelsen, Hans Kristian (1998). Bli kjent med Vestfold / Become acquainted with Vestfold. Stavanger Offset AS. Page 96. ISBN 9788290636017. ^ a b Tore, Sandberg and Cato Arveschoug (2001). Sandefjord zoomet inn av fotograf Tore Sandberg. C. Arveschoug and Magne Helland. Page 6. ISBN 9788299616706. ^ Rygh, Oluf (1907). Norske gaardnavne: Jarlsberg og Larviks amt (in Norwegian) (6 ed.). Kristiania, Norge: W. C. Fabritius & sønners bogtrikkeri. p. 260. ^ Thorsnæs, Geir (8 June 2017). "Sandar – tidligere kommune". Snl.no. Retrieved 28 December 2017. ^ Davidsen, Roger (2008). Et Sted i Sandefjord. Sandar Historielag. Page 353. ISBN 978-82-994567-5-3. ^ a b Davidsen, Roger (2008). Et Sted i Sandefjord. Sandar Historielag. Page 296. ISBN 978-82-994567-5-3. ^ Norske Kommunevåpen (1990). "Nye kommunevåbener i Norden". Retrieved 2009-01-15. ^ "Nytt kommunevåpen for nye Sandefjord kommune". Regjeringen.no (in Norwegian). 2016-09-09. Retrieved 2017-05-28. ^ "Sandefjord kommune - Her er vårt nye kommunevåpen". Sandefjord.kommune.no (in Norwegian). Archived from the original on 2017-01-05. Retrieved 2017-05-28. ^ a b c d e f g h "Sandefjord". Gonorway.no. Retrieved 28 December 2017. ^ a b Børresen, Svein E. (2004). Vestfoldboka: en reise i kultur og natur. Skagerrak forl. Page 38. ISBN 9788292284070. ^ a b c d "Sandefjord - In the footsteps of the Vikings". Visitnorway.com. Retrieved 28 December 2017. ^ a b c "Local history and heritage". Sandefjord.no. Archived from the original on 9 December 2017. Retrieved 28 December 2017. ^ Fodor, Eugene (2004). Fodor's Scandinavia. D. McKay. Page 397. ISBN 9781400013401. ^ George, Francis Stevens (2017). Camp NoE. Lulu Publications, Inc. Page 50. ISBN 9781387047680. ^ Jøranlid, Marianne (1996). 40 trivelige turer i Sandefjord og omegn. Vett Viten. Page 36. ISBN 9788241202841. ^ Evensberget, Snorre (2016). DK Eyewitness Travel Guide Norway. Penguin. Page 129. ISBN 9781465458902. ^ DK Eyewitness Travel (2016). Norway. Penguin. Page 129. ISBN 9781465458902. ^ "The Whaling Monument". Visitvestfold.com. Retrieved 28 December 2017. ^ Tønnessen, Johan Nicolay and Arne Odd Johnsen (1982). The History of Modern Whaling. University of California Press. Page 25. ISBN 9780520039735. ^ a b "Norway Is Home to a Whaling History Museum". Atlas Obscura. Retrieved 28 December 2017. ^ Joensen, Jóan Pauli (2009). Pilot Whaling in the Faroe Islands: History, Ethnography, Symbol. Faroe University Press. Page 225. ISBN 9789991865256. ^ Tønnessen, Johan Nicolay and Arne Odd Johnsen (1982). The History of Modern Whaling. University of California Press. Page 84. ISBN 9780520039735. ^ Bertelsen, Bjørn Enge and Kirsten Alsaker Kjerland (2014). Navigating Colonial Orders: Norwegian Entrepreneurship in Africa and Oceania. Berghahn Books. Page 128. ISBN 9781782385400. ^ Lund, Fredrik Larsen (2017). Norske utposter. Vega forlag. Pages 618-619. ISBN 978-82-8211-537-7. ^ Lund, Fredrik Larsen (2017). Norske utposter. Vega forlag. Pages 665-666. ISBN 978-82-8211-537-7. ^ Hoff, Stein (1985). Drømmen om Galapagos: En ukjent norsk utvandrerhistorie. Grøndahl & Søn. Pages 16-18. ISBN 8250407687. ^ Lund, Fredrik Larsen (2017). Norske utposter. Vega forlag. Pages 666-667. ISBN 978-82-8211-537-7. ^ Headland, Robert (1992). The Island of South Georgia. CUP Archive. Page 130. ISBN 9780521424745. ^ Lund, Fredrik Larsen (2017). Norske utposter. Vega forlag. Page 619. ISBN 978-82-8211-537-7. ^ "Lars Christensen". Norsk Polarhistorie. Retrieved June 1, 2017. ^ "Norvegia ekspedisjon". Norsk Polarhistorie. Retrieved June 1, 2017. ^ Barr, Susan (28 September 2014). "Nils Larsen - 2". Nbl.snl.no. Retrieved 28 December 2017. ^ Holskjær, Lars (2017). Kamper uten tall. Forlagshuset i Vestfold. Pages 116-117. ISBN 9788293407294. ^ Holskjær, Lars (2017). Kamper uten tall. Forlagshuset i Vestfold. Pages 121-122. ISBN 9788293407294. ^ a b Holskjær, Lars (2017). Kamper uten tall. Forlagshuset i Vestfold. Page 192. ISBN 9788293407294. ^ Steen, Sverre (1974). Kristiansands historie 1914-1945. Christianssands sparebank. Page 544. ^ Larsen, Erlend (2016). Tre kommuner blir til én: Suksesskriteriene bak nye Sandefjord. E-forl. Page 8. ISBN 9788293057277. ^ Larsen, Erlend (2016). Tre kommuner blir til én: Suksesskriteriene bak nye Sandefjord. E-forl. Page 208. ISBN 9788293057277. ^ Larsen, Erlend (2016). Tre kommuner blir til én: Suksesskriteriene bak nye Sandefjord. E-forl. Page 116. ISBN 9788293057277. ^ Larsen, Erlend (2016). Tre kommuner blir til én: Suksesskriteriene bak nye Sandefjord. E-forl. Page 136. ISBN 9788293057277. ^ Larsen, Erlend (2016). Tre kommuner blir til én: Suksesskriteriene bak nye Sandefjord. E-forl. Page 72. ISBN 9788293057277. ^ Larsen, Erlend (2016). Tre kommuner blir til én: Suksesskriteriene bak nye Sandefjord. E-forl. Page 165. ISBN 9788293057277. ^ "Folkemengd 1. januar 2011 og endringane i 2010. Endelege tal". Ssb.no. Retrieved 28 December 2017. ^ "Sandefjords Blad - SAS går inn i historien med et smell". Sb.no. Retrieved 28 December 2017. ^ a b Jøranlid, Marianne (1996). 40 trivelige turer i Sandefjord og omegn. Vett Viten. Pages 38-39. ISBN 9788241202841. ^ a b Davidsen, Roger (2008). Et Sted i Sandefjord. Sandar Historielag. Page 3. ISBN 978-82-994567-5-3. ^ a b c d Bertelsen, Hans Kristian (1985). Sandefjord: A modern city with vast potential. Grafisk Studio. Page 4. ISBN 82-90636-00-8. ^ "Skagerak International School: Life in Sandefjord". Skagerak.org. Retrieved 28 December 2017. ^ a b c d e f Lundbo, Sten (24 October 2017). "Sandefjord". Snl.no. Retrieved 28 December 2017. ^ "Video Sandefjord City". Gonorway.com. Retrieved 28 December 2017. ^ Davidsen, Roger (2008). Et sted i Sandefjord: lokalhistorisk stedsnavnsleksikon. Sandar historielag. Page 100. ISBN 9788299456753. ^ Jøranlid, Marianne (1996). 40 trivelige turer i Sandefjord og omegn. Vett Viten. Page 29. ISBN 9788241202841. ^ Davidsen, Roger (2008). Et Sted i Sandefjord. Sandar Historielag. Pages 103-105. ISBN 978-82-994567-5-3. ^ Jøranlid, Marianne (1996). 40 trivelige turer i Sandefjord og omegn. Vett Viten. Page 45. ISBN 9788241202841. ^ "Høyeste fjelltopp i hver kommune - Kartverket". Web.archive.org. 15 October 2014. Archived from the original on 15 October 2014. Retrieved 28 December 2017. ^ Larsen, Erlend (2011). På Tur i Vestfold del 2. E-forlag. Pages 202-204. ISBN 9788293057222. ^ Nikel, David (2017). Moon Oslo. Moon Travel Guides. Page 95. ISBN 978-1631216619. ^ Berezin, Henrik (2011). Norway Travel Adventures. Hunter Publishing, Inc. ISBN 9781588437068. ^ Great Britain. Hydrographic Dept. (1880). The Norway Pilot, Part 2. J. D. Potter. Page 8. ^ Westeng, Kjersti. "Her er det mest sol på sommeren i Norge". Nettavisen.no. Retrieved 28 December 2017. ^ a b c Ebbesen, Jorgen Tandberg (2018). The Sulphureous Bath at Sandefjord in Norway. Sagwan Press. Page 6. ISBN 9781297731068. ^ "Average Weather For Sandefjord, Norway". WeatherSpark. Retrieved May 15, 2015. ^ Davidsen, Roger (2008). Et Sted i Sandefjord. Sandar Historielag. Page 139. ISBN 978-82-994567-5-3. ^ Larsen, Erlend (2016). Tre kommuner blir til én. Erlend Larsen Forlag. Page 13. ISBN 9788293057277. ^ Jøranlid, Marianne (1996). 40 trivelige turer i Sandefjord og omegn. Vett Viten. Pages 114-117. ISBN 9788241202841. ^ Bertelsen, Hans Kristian (1985). Sandefjord: A modern city with vast potential. Grafisk Studio. Page 79. ISBN 82-90636-00-8. ^ "Local Directory Pictures from 1 Sandefjord Vestfold". Gonorway.com. Retrieved 28 December 2017. ^ a b Lee, Phil and Jules Brown (2003). The Rough Guide to Norway. Rough Guides. Page 129. ISBN 9781843530541. ^ a b "Local Directory Pictures from 6 Sandefjord Vestfold". Gonorway.com. Retrieved 28 December 2017. ^ a b c Tore, Sandberg and Cato Arveschoug (2001). Sandefjord zoomet inn av fotograf Tore Sandberg. C. Arveschoug and Magne Helland. Page 147. ISBN 9788299616706. ^ a b Lee, Phil (2012). The Rough Guide To Norway. Rough Guides. Page 118. ISBN 978-1405389716. ^ a b Davidsen, Roger (2008). Et Sted i Sandefjord. Sandar Historielag. Pages 304-305. ISBN 978-82-994567-5-3. ^ a b Bertelsen, Hans Kristian (1985). Sandefjord: A modern city with vast potential. Grafisk Studio. Page 51. ISBN 82-90636-00-8. ^ Flesland, Stig. "Norges rikeste ordfører". Na24.no. Retrieved 28 December 2017. ^ "Han er Norges rikeste ordfører". Dagbladet.no. 19 October 2012. Retrieved 28 December 2017. ^ Larsen, Erlend (2016). Tre kommuner blir til én: Suksesskriteriene bak nye Sandefjord. E-forl. Page 119. ISBN 9788293057277. ^ Davidsen, Roger (2008). Et Sted i Sandefjord. Sandar Historielag. Page 370. ISBN 978-82-994567-5-3. ^ Larsen, Erlend (2011). På Tur i Vestfold del 2. E-forlag. Page 313. ISBN 9788293057222. ^ Jøranlid, Marianne (1996). 40 trivelige turer i Sandefjord og omegn. Vett Viten. Page 27. ISBN 9788241202841. ^ Tore, Sandberg and Cato Arveschoug (2001). Sandefjord zoomet inn av fotograf Tore Sandberg. C. Arveschoug and Magne Helland. Pages 5-6. ISBN 9788299616706. ^ a b "Sandefjord wants your business to succeed". Sandefjord.no. Archived from the original on 9 December 2017. Retrieved 28 December 2017. ^ C. Gopalkrishnan (2016). The Entrepreneur's Choice: Cases on Family Business in India. Routledge. Page 243. ISBN 9781134906598. ^ "Vestviken 24 - Her er Vestfolds 250 største bedrifter". Vestviken24.no. Retrieved 28 December 2017. ^ "Prisvekst og økende omsetning av fritidsboliger ved sjøen". Eiendom Norge. Retrieved 28 December 2017. ^ "Her har boligprisene steget mest - og minst de siste årene". Dn.no. Retrieved 28 December 2017. ^ a b Tollnes, Ivar and Olaf Akselsen (1994). Sandefjord: Den lille storbyen. Sandefjords blad. Page 104. ISBN 9788299070447. ^ Tore, Sandberg and Cato Arveschoug (2001). Sandefjord zoomet inn av fotograf Tore Sandberg. C. Arveschoug and Magne Helland. Page 40. ISBN 9788299616706. ^ Ebbesen, Jorgen Tandberg (2018). The Sulphureous Bath at Sandefjord in Norway. Sagwan Press. Page 18. ISBN 9781297731068. ^ "Norges dyreste hytteområde har en gjennomsnittpris på 7,1 millioner kroner". Abcnyheter.no. 27 December 2012. Retrieved 28 December 2017. ^ a b Tore, Sandberg and Cato Arveschoug (2001). Sandefjord zoomet inn av fotograf Tore Sandberg. C. Arveschoug and Magne Helland. Page 70. ISBN 9788299616706. ^ a b c Bertelsen, Hans Kristian (1985). Sandefjord: A modern city with vast potential. Grafisk Studio. Page 36. ISBN 82-90636-00-8. ^ McKay, D. (2004). Fodor's Scandinavia. Fodor's Travel Publications. Page 398. ISBN 9781400016426. ^ a b Alspaugh, Emmanuelle (2006). Fodor's Norway. Fodor's Travel Publications. Page 74. ISBN 9781400016143. ^ Tollnes, Ivar and Olaf Akselsen (1994). Sandefjord: Den lille storbyen. Sandefjords blad. Page 150. ISBN 9788299070447. ^ Ebbesen, Jorgen Tandberg (2018). The Sulphureous Bath at Sandefjord in Norway. Sagwan Press. Page 11. ISBN 9781297731068. ^ a b c d Tollnes, Ivar and Olaf Akselsen (1994). Sandefjord: Den lille storbyen. Sandefjords blad. Page 140. ISBN 9788299070447. ^ Lee, Phil (2017). The Rough Guide to Norway. Rough Guides. Page 118. ISBN 9780241243183. ^ "Immigrants and Norwegian-born to immigrant parents, by immigration category, country background and percentages of the population". ssb.no. Retrieved 12 Apr 2018. ^ "The Gokstad mound". Visitnorway.com. Retrieved 28 December 2017. ^ "The Viking Trail through Vestfold - Articles - visitvestfold.com". Visitvestfold.com. Retrieved 28 December 2017. ^ Bertelsen, Hans Kristian (1998). Bli kjent med Vestfold / Become acquainted with Vestfold. Stavanger Offset AS. Page 113. ISBN 9788290636017. ^ Davidsen, Roger (2008). Et Sted i Sandefjord. Sandar Historielag. Page 352. ISBN 978-82-994567-5-3. ^ a b "Sandar Church". Visitnorway.com. Retrieved 28 December 2017. ^ Boff-MEN, Emma (19 June 2017). "Sandefjord - where is it, how to get there, and where to stay". Manchestereveningnews.co.uk. Retrieved 28 December 2017. ^ "Midtåsen". Visitoslo.com. Retrieved 28 December 2017. ^ a b "Fill your days with good experiences". Sandefjord.no. Archived from the original on 12 December 2017. Retrieved 28 December 2017. ^ a b Philpott, Don (1991). Visitor's Guide: Norway. Moorland. Page 76. ISBN 9780861904242. ^ "History of The Museum – Hvalfangstmuseet". Hvalfangstmuseet.no. Retrieved 28 December 2017. ^ "The Whale catcher Southern Actor". Visitvestfold.com. Retrieved 28 December 2017. ^ "Southern Actor – Hvalfangstmuseet". Hvalfangstmuseet.no. Retrieved 28 December 2017. ^ Davidsen, Roger (2008). Et Sted i Sandefjord. Sandar Historielag. Page 258. ISBN 978-82-994567-5-3. ^ Tore, Sandberg and Cato Arveschoug (2001). Sandefjord zoomet inn av fotograf Tore Sandberg. C. Arveschoug and Magne Helland. Page 140. ISBN 9788299616706. ^ a b Fodor, Eugene (1991). Fodor's Scandinavian Cities. Fodor's Travel Publications. Page 93. ISBN 9780679019596. ^ OECD (2003). OECD Reviews of Regulatory Reform OECD Reviews of Regulatory Reform: Norway 2003 Preparing for the Future Now: Preparing for the Future Now. OECD Publishing. Page 129. ISBN 9789264103122. ^ Macmillan (2008). Let's Go 2009 Europe. Let's Go, Inc. Page 737. ISBN 9780312387082. ^ "Torp Sandefjord Airport". Visitoslo.com. Retrieved 28 December 2017. ^ "Strömstad-Sandefjord". Fjordline.com. Retrieved 28 December 2017. ^ Doreen, Taylor-Wilkie (2018). Insight Guides Norway. Insight. Page 304. ISBN 978-1780052106. ^ Lonely Planet (1999). Norway. Lonely Planet Publications. Page 98. ISBN 9780864426543. ^ Sinclair, Mick and Peter Bejder (1997). Scandinavia. Rough Guides. Page 158. ISBN 9781858282367. ^ Mšbius, Aaron and Michael Mšbius (2014). Norwegen. DuMont Reiseverlag. Page 167. ISBN 9783770167326. ^ Tore, Sandberg and Cato Arveschoug (2001). Sandefjord zoomet inn av fotograf Tore Sandberg. C. Arveschoug and Magne Helland. Page 51. ISBN 9788299616706. ^ "Rekordsommer på TORP!". Torp.no. Retrieved 28 December 2017. ^ Aarons, Felice (2006). Fodor's Scandinavia. Fodor's Travel Publications, Inc. Page 234. ISBN 9781400016426. ^ "Bus Sandefjord - Transport - Sandefjord". Visitvestfold.com. Retrieved 28 December 2017. ^ "Transport Oslo - Torp Sandefjord Airport". Visitoslo.com. Retrieved 28 December 2017. ^ Tore, Sandberg and Cato Arveschoug (2001). Sandefjord zoomet inn av fotograf Tore Sandberg. C. Arveschoug and Magne Helland. Page 113. ISBN 9788299616706. ^ Bosberry-Scott, Wendy (2012). IB World Schools Yearbook 2012. John Catt Educational Ltd. Page 189. ISBN 9781908095350. ^ Barnes, Jonathan (2012). IB World Schools Yearbook 2013. John Catt Educational Ltd. Page 200. ISBN 9781908095657. ^ Bingham, Derek (2009). The ECIS International Schools Directory 2009/10. John Catt Educational Ltd. Page 181. ISBN 9781904724674. ^ Philpott, Don (1991). The Visitor's Guide to Norway. Moorland. Page 76. ISBN 9780861904242. ^ Tore, Sandberg and Cato Arveschoug (2001). Sandefjord zoomet inn av fotograf Tore Sandberg. C. Arveschoug and Magne Helland. Page 149. ISBN 9788299616706. ^ "Attractions - See and do - Sandefjord - visitvestfold.com". Visitvestfold.com. Retrieved 28 December 2017. ^ Davidsen, Roger (2008). Et Sted i Sandefjord. Sandar Historielag. Page 144. ISBN 9788299456753. ^ Lund, Arild and Charlotte Jørgensen (2001). Larvik. Capella Media. Page 16. ISBN 978-8299606912. ^ "The Whaling Museum". Visitvestfold.com. Retrieved 28 December 2017. ^ "Hvalfangstmuseet". Hvalfangstmuseet.no. Retrieved 28 December 2017. ^ Tore, Sandberg and Cato Arveschoug (2001). Sandefjord zoomet inn av fotograf Tore Sandberg. C. Arveschoug and Magne Helland. Page 14. ISBN 9788299616706. ^ Bertelsen, Hans Kristian (1985). Sandefjord: A modern city with vast potential. Grafisk Studio. Pages 60-61. ISBN 82-90636-00-8. ^ Børresen, Svein E. (2004). Vestfoldboka: en reise i kultur og natur. Skagerrak forl. Page 67. ISBN 9788292284070. ^ "KLP kjøper Hvaltorvet kjøpesenter". Retailmagasinet.no. 28 August 2013. Retrieved 28 December 2017. ^ Larsen, Erlend (2016). Tre kommuner blir til én: Suksesskriteriene bak nye Sandefjord. E-forl. Page 162. ISBN 9788293057277. ^ Hoogendoorn, Hans (2005). ANWB Goud - Noorwegen. ANWB Media - Boeken & Gidsen. Page 83. ISBN 9789018019402. ^ Tollnes, Ivar and Olaf Akselsen (1994). Sandefjord: Den lille storbyen. Sandefjords blad. Page 13. ISBN 9788299070447. ^ "The coastal path at Østerøya and Yxney". Visitvestfold.com. Retrieved 28 December 2017. ^ "Kyststien Brochure : Side 2" (PDF). Sandefjord.kommune.no. Retrieved 28 December 2017. ^ "Marked trails from the center of Sandefjord". Visitvestfold.com. Retrieved 28 December 2017. ^ Larsen, Erlend (2010). På Tur i Vestfold del 1. E-forlag. Page 20. ISBN 9788293057130. ^ "Sandefjord - Vinteraktiviteter". Sandefjord.kommune.no. Retrieved 28 December 2017. ^ "Sandefjords Blad - Alle stier fører til Goksjø". Sb.no. Retrieved 28 December 2017. ^ Larsen, Erlend (2011). På Tur i Vestfold del 2. E-forlag. Page 526. ISBN 9788293057222. ^ Ebbesen, Jorgen Tandberg (2018). The Sulphureous Bath at Sandefjord in Norway. Sagwan Press. Page 10. ISBN 9781297731068. ^ Porter, Darwin and Danforth Prince (2003). Frommer's Norway. Wiley. Page 159. ISBN 9780764524677. ^ Jøranlid, Marianne (1996). 40 trivelige turer i Sandefjord og omegn. Vett Viten. Page 86. ISBN 9788241202841. ^ Jøranlid, Marianne (1996). 40 trivelige turer i Sandefjord og omegn. Vett Viten. Page 38. ISBN 9788241202841. ^ Nature Preserves in Vestfold County. Visited December 9, 2017. ^ "Head Above Water". IMDb.com. 1 August 1993. Retrieved 28 December 2017. ^ "Deadline Torp med suksess". Nrk.no. Retrieved 28 December 2017. ^ "Deadline Torp". IMDb.com. 13 January 2005. Retrieved 28 December 2017. ^ ""Outrageous Acts of Science" Power Junkies (TV Episode 2012)". IMDb.com. Retrieved 28 December 2017. ^ "Episode #5.26". IMDb.com. 4 October 2010. Retrieved 28 December 2017. ^ "Den starkaste (1929)". IMDb.com. Retrieved 28 December 2017. ^ "Valfångare (1939) – The Swedish Film Database". Svenskfilmdatabas.se. Retrieved 28 December 2017. ^ "Valfångare". IMDb.com. 24 October 1942. Retrieved 28 December 2017. ^ "Sandefjords Blad - Spilte inn musikkvideo i Andebu". Sb.no. Retrieved 28 December 2017. ^ "Sandefjords Blad - Sandefjording med Bare Egil-video på NRK". Sb.no. Retrieved 28 December 2017. ^ "Sandefjords Blad - Terje Vigen ror i Sandefjord". Sb.no. Retrieved 28 December 2017. ^ "Ulv i Vestfold?". Nrk.no. Retrieved 28 December 2017. ^ "Sandefjords Blad - Sjelden Vestfold-gjest fanget på foto". Sb.no. Retrieved 28 December 2017. ^ "Tønsbergs Blad - Ulv trolig oppdaget i Sandefjord". Tb.no. Retrieved 28 December 2017. ^ Larsen, Erlend (2011). På Tur i Vestfold del 2. E-forlag. Page 22. ISBN 9788293057222. Wikimedia Commons has media related to Sandefjord. Look up Sandefjord in Wiktionary, the free dictionary. This page was last edited on 21 April 2019, at 04:59 (UTC).